schedule to reduce worker’s compensation costs. This legislation, which is a negotiated agreement from the Worker’s Compensation Advisory Council, also increases weekly benefits. Please approve and enact SB 665 before adjourning the 2017-2018 legislative session. Wisconsin employers have taken action to protect their valued employees and to minimize the impact of worker’s compensation costs by investing in safety equipment, protocols, and training. This resulted in a reduction in workplace injuries by 57 percent between 1994 and 2014. 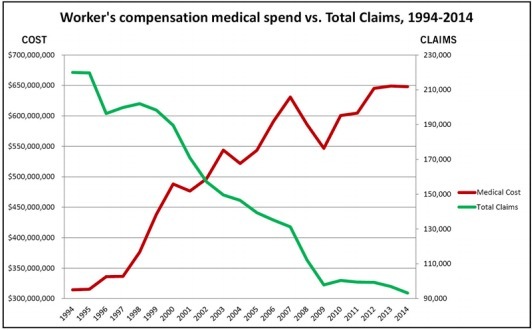 Unfortunately, no cost savings to employers has materialized, as medical costs per claim rose a whopping 450 percent in the same period. compensation in the nation. In fact, a recent Worker’s Compensation Research Institute found them to be 47 percent higher than the national median. Without legislative action to establish a cost-control mechanism, worker’s compensation medical costs will continue to skyrocket, challenging growth within the dairy products industry and many others in the state.